Swiss mathematician, born at Basel on the 15th of April 1707, his father Paul Euler, who had considerable attainments as a mathematician, being Calvinistic pastor of the neighboring village of Riechen. After receiving preliminary instructions in mathematics from his father, he was sent to the University of Basel, where geometry soon became his favorite study. His mathematical genius gained for him a high place in the esteem of Jean Bernoulli, who was at that time one of the first mathematicians in Europe, as well as of his sons Daniel and Nicolas Bernoulli. Having taken his degree as master of arts in 1723, Euler applied himself, at his father's desire, to the study of theology and the Oriental languages with the view of entering the church, but, with his father's consent, he soon returned to geometry as his principal pursuit. At the same time, by the advice of the younger Bernoullis, who had removed to St. Petersburg in 1725, he applied himself to the study of physiology, to which he made a happy application of his mathematical knowledge; and he also attended the medical lectures at Basel. While he was engaged in physiological researches, he composed a dissertation on the nature and propagation of sound, and an answer to a prize question concerning the masting of ships, to which the French Academy of Sciences adjudged the second rank in the year 1727. In 1727, on the invitation of Catherine I, Euler took up his residence in St. Petersburg, and was made an associate of the Academy of Sciences. In 1730 he became professor of physics, and in 1733 he succeeded Daniel Bernoulli in the chair of mathematics. At the commencement of his new career he enriched the academical collection with many memoirs, which excited a noble emulation between him and the Bernoullis, though this did not in any way affect their friendship. It was at this time that he carried the integral calculus to a higher degree of perfection, invented the calculation of sines, reduced analytical operations to a greater simplicity, and threw new light on nearly all parts of pure mathematics. In 1735 a problem proposed by the academy, for the solution of which several eminent mathematicians had demanded the space of some months, was solved by Euler in three days, but the effort threw him into a fever which endangered his life and deprived him of the use of his right eye. The Academy of Sciences at Paris in 1738 adjudged the prize to his memoir on the nature and properties of fire, and in 1740 his treatise on the tides shared the prize with those of Colin Maclaurin and Daniel Bernoulli -- a higher honor than if he had carried it away from inferior rivals. In 1741 Euler accepted the invitation of Frederick the Great to Berlin, where he was made a member of the Academy of Sciences and professor of mathematics. He enriched the last volume of the Mélanges or Miscellanies of Berlin with five memoirs, and these were followed, with an astonishing rapidity, by a great number of important researches, which are scattered throughout the annual memoirs of the Prussian Academy. At the same time he continued his philosophical contributions to the Academy of St. Petersburg, which granted him a pension in 1742. The respect in which he was held by the Russians was strikingly shown in 1760, when a farm he occupied near Charlottenburg happened to be pillaged by the invading Russian army. On its being ascertained that the farm belonged to Euler, the general immediately ordered compensation to be paid, and the empress Elizabeth sent an additional sum of four thousand crowns. In 1766 Euler with difficulty obtained permission from the King of Prussia to return to St. Petersburg, to which he had been originally invited by Catherine the Great. Soon after his return to St. Petersburg a cataract formed in his left eye, which ultimately deprived him almost entirely of sight. It was in these circumstances that he dictated to his servant, a tailor's apprentice who was absolutely devoid of mathematical knowledge, his Anleitung zur Algebra (1770), a work which, though purely elementary, displays the mathematical genius of its author, and is still reckoned one of the best works of its class. Another task to which he set himself immediately after his return to St. Petersburg was the preparation of his Lettres à une princesse d'Allemagne sur quelques sujets de physique et de philosophie (3 vols, 1768-72). They were written at the request of the princess of Anhalt-Dessau, and contain an admirably clear exposition of the principal facts of mechanics, optics, acoustics and physical astronomy. Theory, however, is frequently unsoundly applied in it, and it is to be observed generally that Euler's strength lay rather in pure than in applied mathematics. 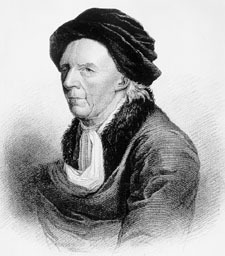 In 1755 Euler had been elected a foreign member of the Academy of Sciences at Paris, and some time afterwards the academical prize was adjudged to three of his memoirs Concerning the Inequalities in the Motions of the Planets. The two prize questions proposed by the same academy for 1770 and 1772 were designed to obtain a more perfect theory of the moon's motion. Euler, assisted by his eldest son Johann Albert, was a competitor for these prizes, and obtained both. In the second memoir he reserved for further consideration several inequalities of the moon's motion, which he could not determine in his first theory, on account of the complicated calculations in which the method he then employed had engaged him. He afterwards reviewed his whole theory with the assistance of his son and W. L. Krafft and A. J. Lexell, and pursued his researches until he had constructed the new tables, which appeared in his Theoria motuum lunae (1772). Instead of confining himself, as before, to the fruitless integration of three differential equations of the second degree, which are furnished by mathematical principles, he reduced them to the three coordinates which determine the place of the moon; and he divided into classes all the inequalities of that planet, as far as they depend either on the elongation of the sun and moon, or upon the eccentricity, or the parallax, or the inclination of the lunar orbit. The inherent difficulties of this task were immensely enhanced by the fact that Euler was virtually blind, and had to carry all the elaborate computations it involved in his memory. A further difficulty arose from the burning of his house and the destruction of the greater part of his property in 1771. His manuscripts were fortunately preserved. His own life was only saved by the courage of a native of Basel, Peter Grimmon, who carried him out of the burning house. Some time after this an operation restored Euler's sight; but a too harsh use of the recovered faculty, along with some carelessness on the part of the surgeons, brought about a relapse. With the assistance of his sons, and of Krafft and Lexell, however, he continued his labors, neither the loss of his sight nor the infirmities of an advanced age being sufficient to check his activity. Having engaged to furnish the Academy of St. Petersburg with as many memoirs as would be sufficient to complete its Acta for twenty years after his death, he in seven years transmitted to the academy above seventy memoirs, and left above two hundred more, which were revised and completed by another hand. Euler's knowledge was more general than might have been expected in one who had pursued with such unremitting ardor mathematics and astronomy as his favorite studies. He had made very considerable progress in medical, botanical and chemical science, and he was an excellent classical scholar, and extensively read in general literature. He was much indebted to an uncommon memory, which seemed to retain every idea that was conveyed to it, either from reading or meditation. He could repeat the Aeneid of Virgil from the beginning to the end without hesitation, and indicate the first and last line of every page of the edition which he used. Euler's constitution was uncommonly vigorous, and his general health was always good. He was enabled to continue his labors to the very close of his life. His last subject of investigation was the motion of balloons, and the last subject on which he conversed was the newly discovered planet Herschel (Uranus). He died of apoplexy on the 18th of September 1783, while he was amusing himself at tea with one of his grandchildren. Euler's genius was great and his industry still greater. His works, if printed in their completeness, would occupy from 60 to 80 quarto volumes, exceeded only by the mathematical works of Paul Erdos. He was simple and upright in his character, and had a strong religious faith. He was twice married, his second wife being a half-sister of his first, and he had a numerous family, several of whom attained to distinction. His éloge was written for the French Academy by the Marquis de Condorcet, and an account of his life, with a list of his works, was written by Von Fuss, the secretary to the Imperial Academy of St. Petersburg.